A hyperbola can be considered as an ellipse turned inside out. Like the ellipse, it has two foci; however, the difference in the distances to the two foci is fixed for all points on the hyperbola. For an ellipse, of course, it's the sum of the distances which is fixed. If a hyperbola is "stretched" to the limit, it turns into a parabola, as does the ellipse; but for the hyperbola as we've drawn it here, it's the lower focus which goes to infinity (to form an upward-facing parabola), while for a similarly oriented ellipse, it's the upper focus (again, if you want form an upward-facing parabola). To turn an ellipse into a hyperbola, then, we can send its upper focus to infinity, and then retrieve a new lower focus from -infinity. At the boundary between the two, the figure is a parabola, which could be said to have three foci, two of which are infinitely distant (but we normally say, instead, that it has a directrix and just one focus). In figure 1 we show a hyperbola with foci on the Y axis at +/- 2 units from the origin, for which the difference in the distances to the two foci is 2 units. 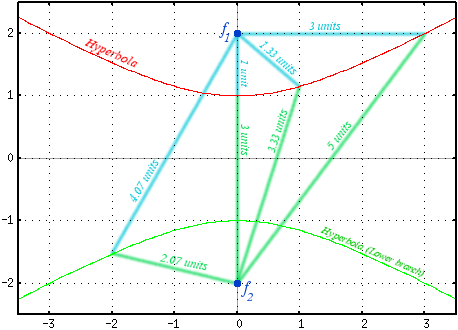 We've shown both "branches" of the hyperbola, though on the rest of this page we'll be concerned only with the upper branch. Like a parabola or ellipse, a hyperbola has its own "focus property": All incident rays which are directed at the lower focus and which hit the upper branch will be reflected to the upper focus, instead. Conversely, rays which come from the first focus and strike the hyperbola will be reflected along a path that makes them appear to have come from the second focus; in this sense, f2 is an "image" of f1. We shall prove that fact on this page, and then we'll show that an infinitely stretched hyperbola really does turn into a parabola, and go on to derive an equation for a hyperbola, and finally demonstrate that the familiar y=1/x is really a hyperbola. In figure 2, we show two points on a hyperbola, P1 and P2, which are infinitesimally close together, in a greatly magnified image. The proof is contained entirely in the picture; we will describe the details in words, below. From point P1, we show rays a1 and b1 which lead to focus 1 and focus 2, respectively. From point P2, we show rays a2 and b2 which lead to focus 1 and focus 2, respectively. P1 and P2 are assumed to be so close together that rays a1 and a2 are (nearly) parallel, and rays b1 and b2 are (nearly) parallel. By the definition of a hyperbola, the difference in length between ray a1 and ray b1 must be equal to the difference in length between ray a2 and ray b2. Ray b2 is ε units longer than ray b1. Therefore, if the differences are to be equal, ray a2 must also be ε units longer than ray a1. That is the key to the proof! Look at triangles ABC and DEC in figure 1. They're right triangles, they each have side C as the hypotenuse, and sides A and D are equal (each is ε units long). Therefore the two triangles are identical (save that one's flipped over). Therefore, angles α and β must be equal. 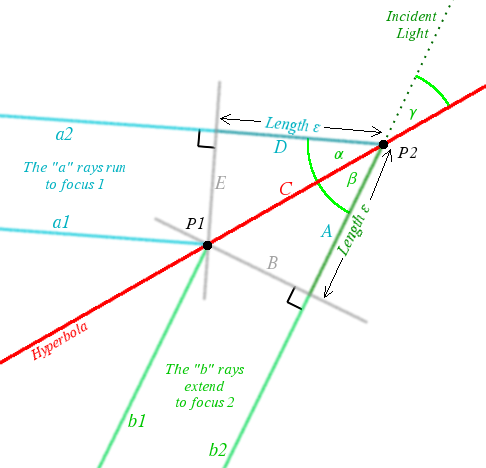 The line marked "Incident Light" is the extension of ray b2 through the hyperbola, and the angle it forms with the hyperbola must, of course, be equal to the angle b2 forms with the hyperbola. So, angles β and γ must be equal. But then angles α and γ must also be equal. Light coming to point P2 which was directly at focus f2 must come in along the "Incident Light" line, with incident angle γ. Its angle of reflection must equal its angle of incidence; but then, it must be reflected along ray a2. Ray a2 leads to focus f1, which is what was to be shown. Note that the argument given here was identical to the argument we used on the parabola focus page. The only significant difference is that figure 2 on the parabola page was shown rotated, so that lines B1 and B2 run straight down to the directrix. They could just as well be running down to a lower focal point which was located very far away; we discuss this at a bit more length in the next section. Move focus f2 down to -infinity. Now, lines which are directed toward f2 must all go straight down. So, all lines arriving parallel to the axis will be reflected to focus f1, and the figure must be a parabola, as we saw here on the parabola focus page. Q.E.D. Shift everything in figure 1 down a bit so that the upper branch of the hyperbola touches the origin. Place f1 δ units above the X axis, and fix the difference in the distance to the two foci at 2(f-δ) units, where the distance between the foci is 2f. Now, send the lower focus arbitrarily far away. The hyperbola will still just touch the origin, but what happens at nearby points on the hyperbola? As we move away from the origin, and consequently farther from f1, we must also move farther from f2 in order to keep the difference in the distances fixed. But since f2 is arbitrarily far away, all lines to f2 run (almost exactly) straight down. Draw a line parallel to the X axis, and δ units below the origin; call it the directrix. Lines leading to f2 are all (almost exactly) perpendicular to the directrix. A point on the hyperbola which is ε units farther from f1, and consequently ε units farther from f2, must also be ε units farther from the directrix. So, the difference in distances between a point on the hyperbola and f1 and the directrix must also be the same for all points on the hyperbola. By the difference in the distances for the point at the origin is zero (it's δ units from f1 and from the directrix). So, all points on the hyperbola are equidistant from f1 and the directrix, which is the definition of a parabola. And that is what was to be shown. This proof would benefit enormously from a picture, but I haven't drawn one for it (as yet). A little farther down the page we'll do this over symbolically. So far we've just worked directly with the definition of a hyperbola. Let's find an equation for one. The form of (8) isn't useful for taking a limit as the lower focus goes to infinity, because the hyperbola heads off to infinity, too. We want a formula which keeps the upper branch of the hyperbola touching the X axis as we "stretch" it. To obtain an easily recognizable form, we'd also like the "end" of the hyperbola to be touching the origin. and this is, indeed, a hyperbola.